The UK consumes circa 16 million m3 of sawn wood and panel products annually, the vast majority of which is believed to be used either directly or indirectly by the construction industry. But is the timber industry giving construction industry customers what they want with regard to sustainability? This will probably depend on who you are talking to within the supply chain, but according to some senior sustainability managers from a number of major contractors, there are some fundamental requirements that must be met. The primary concern (other than getting the right timber on site at the right time) is that it must be from a verifiable legal and sustainable source. 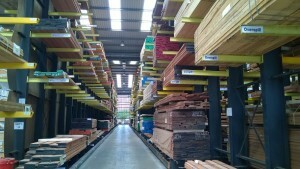 For legality, this will need to meet the requirements of the EU Timber Regulation. However, when talking about sustainability, contractors are not just looking at the environmental issues, such as ensuring the timber is harvested from forests that will be replanted, they are looking to ensure the wider social and economic issues are also met. Associated with this is local sourcing, which is becoming a key requirement for a number of construction clients. There are also the issues of resource efficiency, and alternative and innovative new products and how these may perform over time in a given situation. control on the use of chemicals and correct disposal of waste. CPET also ensures traditional tenure and use rights are observed, consulting and working with indigenous populations who rely on the forest, labour rights (freedom of association, elimination of forced or child labour and discrimination), health and safety of workers, training, grievances and disputes. At the time of writing, CPET has only approved the Forest Stewardship Council (FSC) and the Programme for the Endorsement of Forest Certification (PEFC) schemes as being compliant with its requirements, achieving almost identical scores in the latest review from 2015. In addition to these minimum requirements, many clients and contractors have specific project or company requirements that could include an FSC-only policy or a requirement for FSC or PEFC project certification. For example, some clients and contractors are members of the World Wide Fund for Nature Global Forest & Trade Network, which promotes the use of FSC-certified wood. Another key requirement in recent years has been the move by contractors, in many cases at the request of the client driven in part by the Social Value Act, for more locally sourced products and services. The UKCG procurement statement was redrafted to include this the additional requirement: ‘We will give preference to schemes that support the principles of the Social Value Act, eg the use of timber and timber products which are assured as “Grown in Britain”’ and this was published on the Grown in Britain website. The majority of UKCG members subsequently signed up to support the Grown in Britain campaign and procure British grown timber where feasible. Grown in Britain also forms part of the social value assessment carried out by the Considerate Constructors Scheme. Grown in Britain is a not-for-profit organisation that is trying to reconnect the British public and business to our woodlands and the timber resources it can provide. According to the Forestry Commission Timber Utilisation Statistics 2015 Report, only around 15% of the sawn softwood the construction industry uses is sourced from the UK, and although there are no specific figures for hardwood used in construction, the Forestry Commission Statistics 2016 state that UK sourced hardwood made up less than 10% of the total hardwood market. Therefore individuals and organisations must insist on using Grown in Britain timber wherever practicable to improve these statistics. The Grown in Britain licencing scheme (GiB) is a chain of custody scheme that confirms the provenance of timber, and is specifically aimed at timber grown in the UK and products manufactured from this timber, as well as the woodlands. In most cases it will sit alongside a product’s FSC or PEFC chain of custody certification, but in certain circumstances, such as where there is a requirement to source timber from a particular local woodland, it can also act as an assurance of legality and sustainability. The key requirement of a GiB licensed woodland is that it meets the requirements of the UK Forestry Standard (UKFS). Timber traceable to a forest with a fully implemented forest management plan in line with the UKFS requirements and guidelines also meets the UK Government’s Timber Procurement Policy. With more focus on the circular economy, and the associated resource efficiency, clients and contractors are also looking to incorporate more reused and recycled material into their projects. The Ellen MacArthur Foundation describe the circular economy as “one that is restorative and regenerative by design, and which aims to keep products, components and materials at their highest utility and value at all times, distinguishing between technical and biological cycles.” Although timber is the construction industry’s ultimate renewable resource, this does not mean it should be sent out as biomass for energy production, or worse landfill, after its first use. Many timber components can be either reused in their original form or recycled into new materials such as chipboard, keeping them at their highest utility and value. There are a number of reuse organisations that will collect unwanted timber from construction sites and timber processors for reuse. One of these is the National Community Wood Recycling Project (NCWRP), which is a social enterprise that has been promoted by many in the construction industry as it helps to create sustainable employment for local people, especially those who might find it difficult to get into employment. FSC and PEFC both have allowances within their schemes to cater for recycled content within a product. Ensuring products containing recycled timber materials are certified to one or more of these schemes helps to demonstrate that resource efficiency has been considered in the manufacturing process. The timber industry should also be looking at how its products could be easily removed and reused at the end of their service life. This could be removable hoarding panels that may only be in place for a few months, or floorboards that could be in place for a lot longer. For contractors receiving deliveries on a construction site, the key to confirming whether a product is FSC or PEFC certified (or Grown in Britain licensed) is the delivery ticket. All the above schemes require a minimum amount of information, including the claim and the certificate number, to be noted on both the delivery ticket and the invoice. However, all too often timber, or more likely timber products, turn up on site without this minimum information on the delivery ticket. This needs to be addressed by the wider construction supply chain to ensure full chain of custody is maintained throughout the supply chain. In addition, one thing contractors would really like to see on delivery tickets is the volume of product (preferably against each item, but a total volume would be useful as a minimum) as this aids with the reporting required for project certification and industry monitoring. Where timber merchants, who generally meet the documentation requirements, are supplying materials to manufacturers they know are supplying into the construction industry, but they are not part of the timber industry (for example, lift cars contain a surprising amount of timber and panel products), it would be great if they could impart their knowledge on chain of custody and its requirements; this is something the Timber Trade Federation is looking at. In addition, the Supply Chain Sustainability School (www.supplychainschool.co.uk) has some useful online training modules on chain of custody and what is required, produced in association with Exova BM TRADA, which can all be accessed free of charge. There will, however, always be situations where it may not be possible to obtain a specified product with the right sustainability requirements, for example plywood is not manufactured in the UK, so a Grown in Britain plywood product would not be obtainable at this time. This is where the knowledge of the timber industry should really come to the fore, by suggesting alternative products that may suit a client’s requirements. For example, it may be possible to use an OSB board instead of plywood, as this would be available from a home-grown source. Linked to this is the rise of modified wood products such as acetylated timber (for example, Accoya®) and thermally modified products (Brimstone and ThermoWood®). These are now increasingly being specified for external applications in lieu of other timber species due to their improved resistance to insect and fungal attack. Where there is any doubt as to the proper application of a timber product, the contractor can always be referred to TRADA for their expert opinion. Call the TRADA Advisory line on 01494 569601. This article was previously publish in the TRADA Timber 2017 Industry Yearbook.